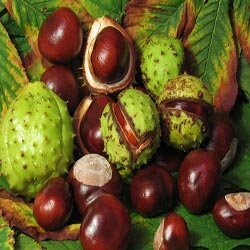 Horse chestnut is also known as Spanish chestnut, buckeye, Aesculus hippocastanum. The trees are indigenous to Albania, Serbia, Macedonia and Bulgaria. It also grows all through the Northern Hemisphere and is cultivated widely right through the temperate world. It is not to be confused with California or Ohio buckeye tree. They are related but are not of the same species. For centuries, buckeye seeds, bark, flowers, and leaves have been used to treat numerous conditions and diseases. Buckeye seed extract has been employed to treat CVI (chronic venous insufficiency). It is a condition, which is associated with ankle swelling, varicose veins, pain, itching, feelings of heaviness, as well as nighttime leg cramping. The buckeye seed extract has also been employed for hemorrhoids. Buckeye seed extract is standardized to contain 20 to 16 percent aescin, the active ingredient. It is the most regularly used form. Aescin is Saponin (a group of chemical compounds). Evidence from animal, laboratory, and human research shows that buckeye seed extract might be helpful to patients with CVI. Studies report major decreases in leg pain, leg size, itchiness, tenseness, and fatigue. There is evidence that buckeye seed extract might be as helpful as compression stockings. Raw buckeye seeds, bark, flowers and leaves contain esculin. Esculin is poisonous. When it is processed properly, buckeye seed extract has little esculin or none at all and is considered normally safe. However, it can cause a few side effects, including nausea itching, or gastrointestinal upset.